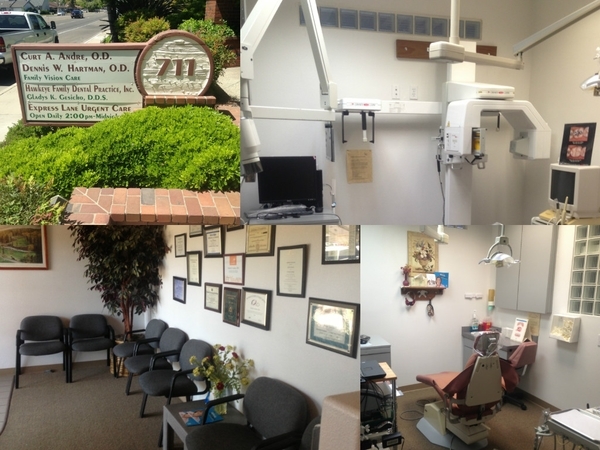 Hawkeye Family Dental Practice of Turlock is your home for complete and gentle dental health care. In our friendly, family-oriented atmosphere, we offer the latest methods and treatments in all areas of dental care; from general dentistry and preventive care to restorative treatments, to cosmetic dentistry and dental implants. (See our complete list of services) So, whether you have a toothache, need a filling or crown, have a dental emergency or are just unhappy with your smile, we have solutions for you and your entire family.We are among the first dentists in Turlock to offer clear invisalign braces,same day cerec crowns and Implant options to our patients. Hawkeye Family Dental Practice in Turlock provides the highest quality dental health treatments along with stress-free, friendly and personalized service. All new patients receive a comprehensive oral examination using our intra oral digitai camera, complete with digital x-rays, a detailed analysis of their needs and the options available to satisfy those needs.A standard of excellence in personalized dental care enables us to provide the quality dental services our patients deserve. We provide comprehensive treatment planning and use restorative and cosmetic dentistry to achieve your optimal dental health. Should a dental emergency occur, we make every effort to see and care for you as soon as possible and even on the same day. Hawkeye Family Dental Practice in Turlock provides all of your dental needs from preventive care and children’s dental health, to dental emergencies and preventive care. We can address every condition due to oral health including oral hygiene, extractions, chipped teeth, deep cleaning, halitosis (bad breath) gum disease, nervous patient care, mouth guards and much more.We save our patients money by providing services inhouse instead of referring them to a specialist.These include implants,root canal treatment,invisalign braces and difficult tooth expraction.We also cater to our patients who need sedation. As your Turlock Family Dentistry office, we are true believers that preventative care and education are the keys to optimal dental health. We strive to provide “dental health care” vs. “disease care”. That’s why we focus on thorough exams – checking the overall health of your teeth and gums, performing oral cancer exams, and taking x-rays when necessary. We also know that routine cleanings, flossing, sealants, and fluoride are all helpful in preventing dental disease. Not only are we focused on the beauty of your smile, we’re also concerned about your health. A review of your medical history can help us stay informed of your overall health, any new medications, and any illnesses that may impact your dental health. Infection control in our office is also very important to us. To protect our Turlock, CA patients and ourselves, we strictly maintain sterilization and cross contamination processes using standards recommended by the American Dental Association (ADA), the Occupational Safety and Health Administration (OSHA), and the Center for Disease Control (CDC).